May 31, 2011 Daily Photo. Taken on 5/29/11. 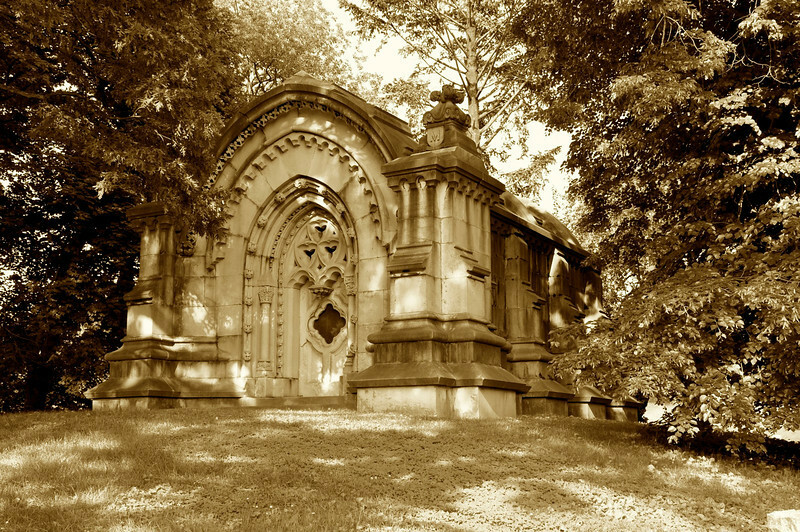 This massive Mausoleum is located in The Green-Wood Cemetery in Brooklyn, tucked away behind large trees. I find it unusual in that it has no names anywhere on it. You can see the letter "M" on the top of the front columns, although one is not visible in this photo. The front door has a screen rather than glass and the small windows in the stone above the door are also missing glass. I'm guessing this is about 150 years old based on the architecture and condition. Green-Wood opened in 1838 and was and remains a favorite resting place of the elite. I just walked by there today, snapped a similar photo, and was also wondering who "M" was. And amazingly, that door is made of stone - there's a keyhole in it. It's amazing that you can find beauty in a cemetery of all places. Very nice. Interesting piece of info! Lovely tonal quality! Oh yes, I see the "M". This certainly is beautiful, it would be interesting to know more about it. Nice pp! Nicely captured, I like the sepia tone. That's quite a mausoleum. Nice stone work. Beautiful pp -- perfect for this incredible architecture! Great treatment and a very neat architectural structure. beautiful tones, contrasts, light and comp!